Manual rain gauge measurements are made at 7:00am daily and reported to the CoCoRaHS website. 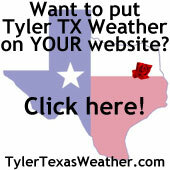 The current reports for Smith county are shown on the map below. To see rainfall for a different date, select the on the calendar icon, then click on the View Map button.